Have you ever tried your hand at jewellery making? I’m not talking about stringing beads on to string, but working with gold or silver. 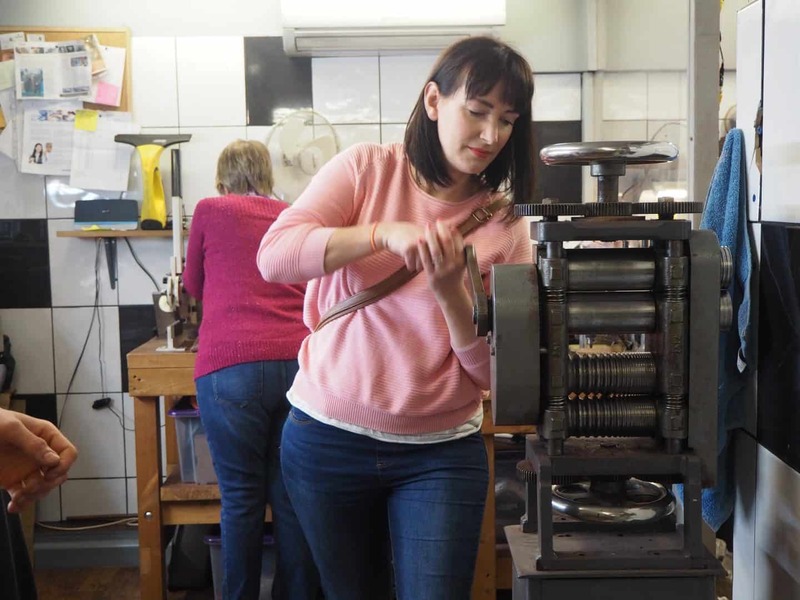 I hadn’t until recently, when I was lucky enough to go behind the scenes at The Goldsmithy Goldsmiths Ltd. 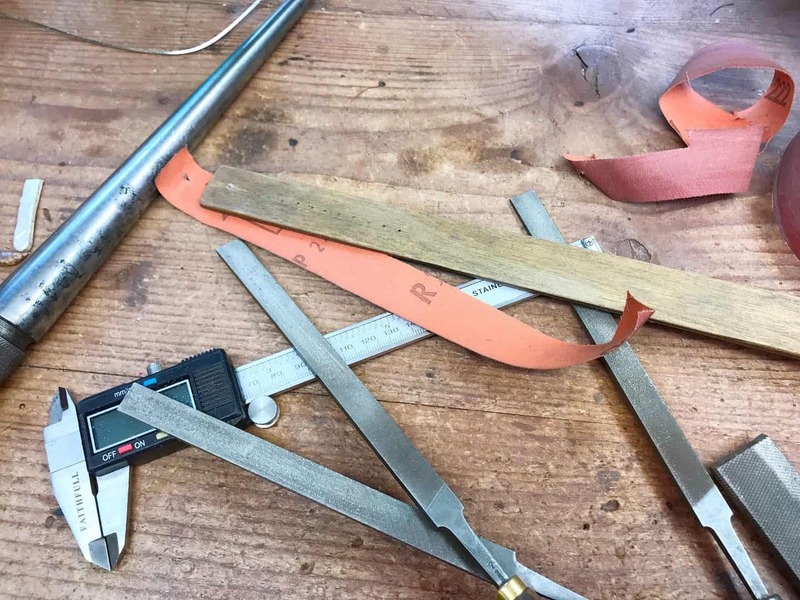 I wasn’t sure what to expect, but when I arrived at their cosy workshop in Stony Stratford near Milton Keynes, I didn’t know what to look at first. It’s crammed full of interesting tools, slightly scary looking open flames and equipment and pictures of amazingly intricate jewellery. You can instantly tell these guys are the real deal. 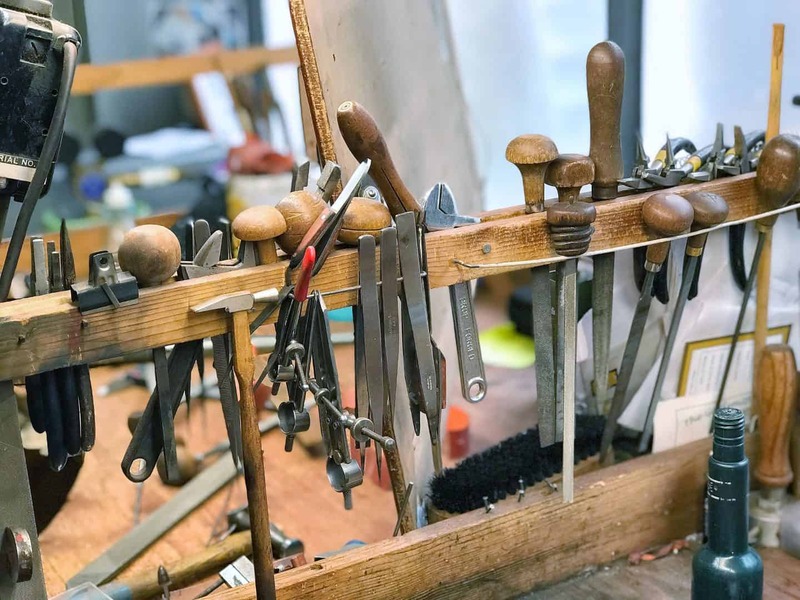 The Goldsmithy Goldsmiths is tucked behind the High Street in the pretty market town of Stony Stratford, near Milton Keynes. 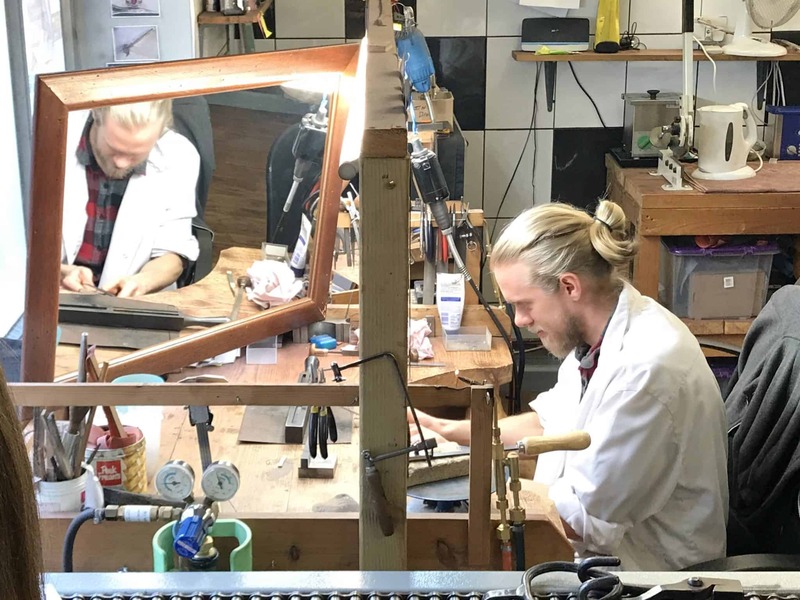 It’s run by father and son team Glenn and Paul Chapman, and their passion for making real jewellery shines through the minute they start talking. Paul (above) is three years into his five year apprenticeship, and he is so enthusiastic about the craft. He works alongside his dad Glenn (below) who trained at Cartier around 40 years ago. 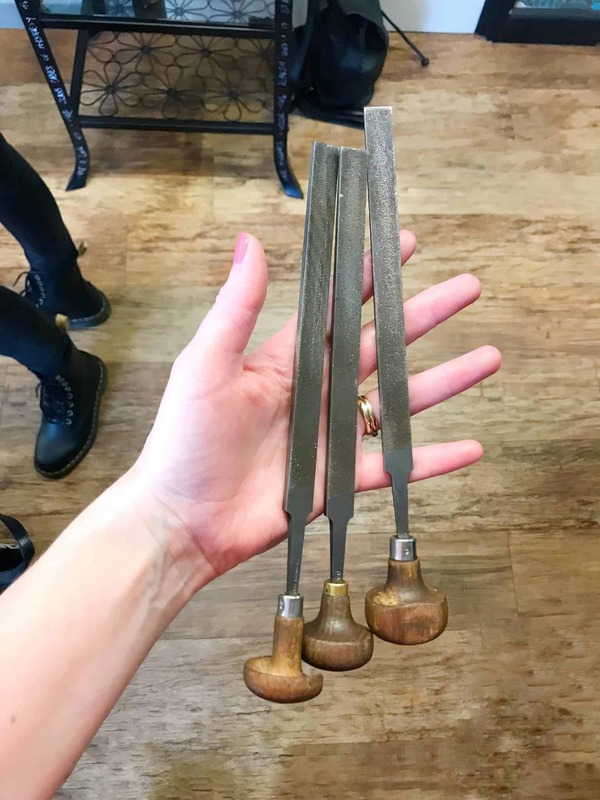 We got to use some of the tools the goldsmiths use to create their bespoke jewellery, including this set of files. It’s amazing that something so big is used to make something so delicate, isn’t it? 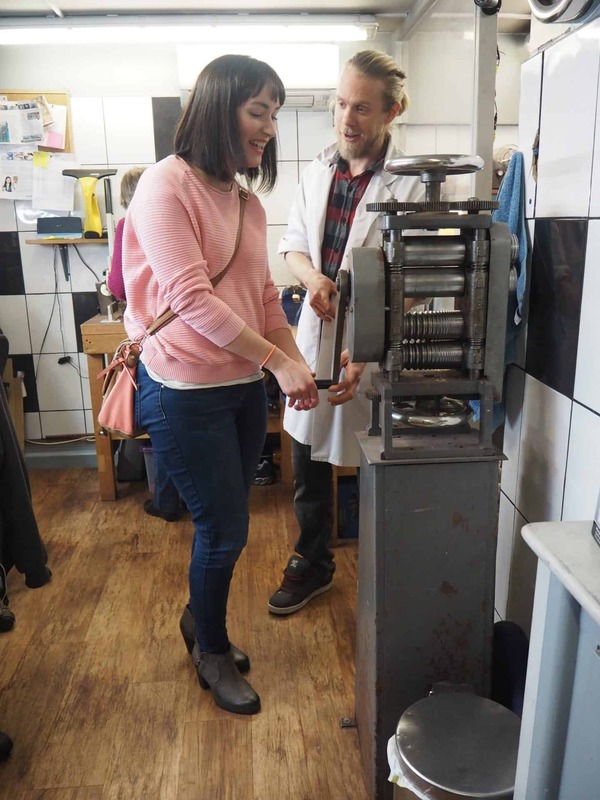 I had a go at putting some silver through this mangle-style machine (it’s obviously a lot more technical than that but that’s the best way I can describe it!) 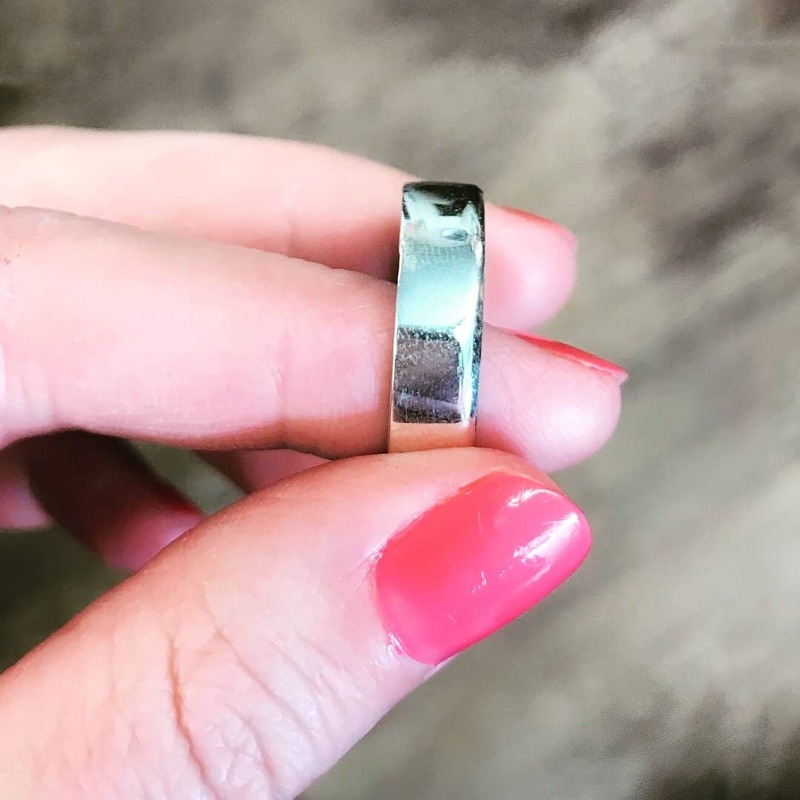 It squeezes the silver and is really difficult to turn! Thanks to Kara Caradas from Heels in My Backpack for the photos of me. 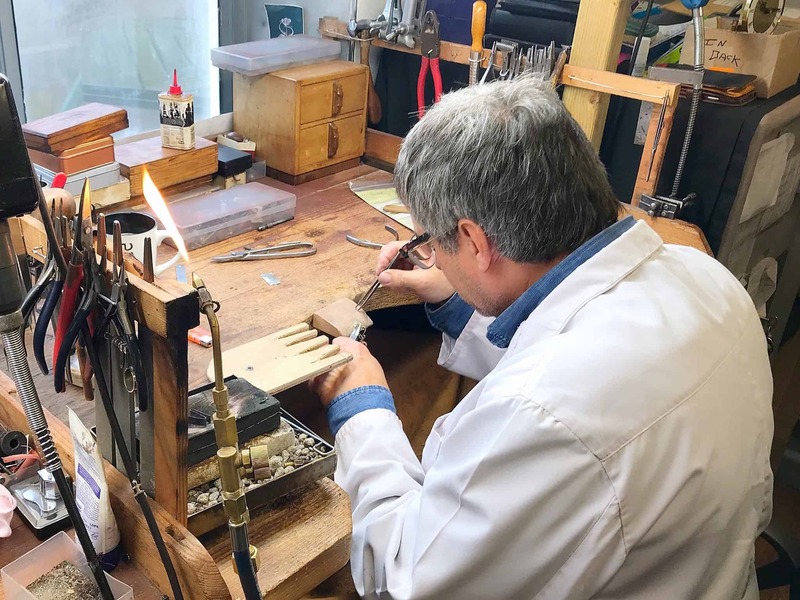 Glenn and Paul at The Goldsmithy Goldsmiths are passionate about using traditional methods to create bespoke jewellery. They’ll work with you, to create something truly personal that fits your budget. Instead of settling for something that you quite like, or is almost what you want, you can get something that’s perfect for you. 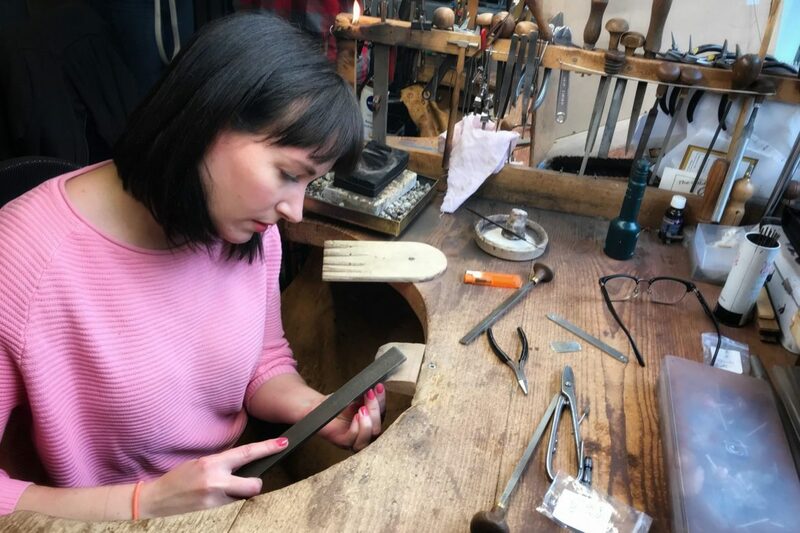 The Goldsmithy Goldsmiths will even save the old fashioned jewellery that’s languishing at the back of your dressing table drawer. 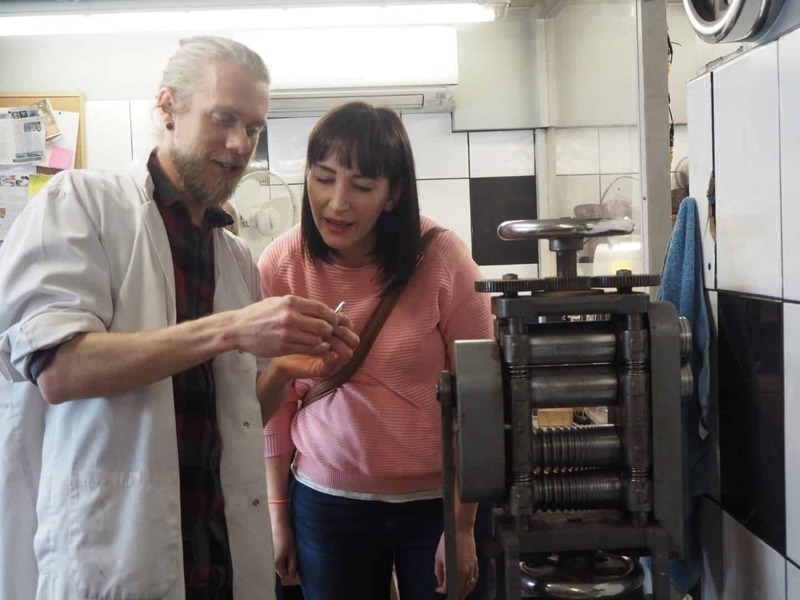 They can recycle sentimental jewellery that’s been handed down to you: it’s precious because it came from a relative, but it’s just not your style. They’ll melt it down and make it into something you’ll be proud to wear. Because their work is guaranteed for 25 years, you know you’re getting something perfect. If you’re keen to have a go yourself, you can even help make it. 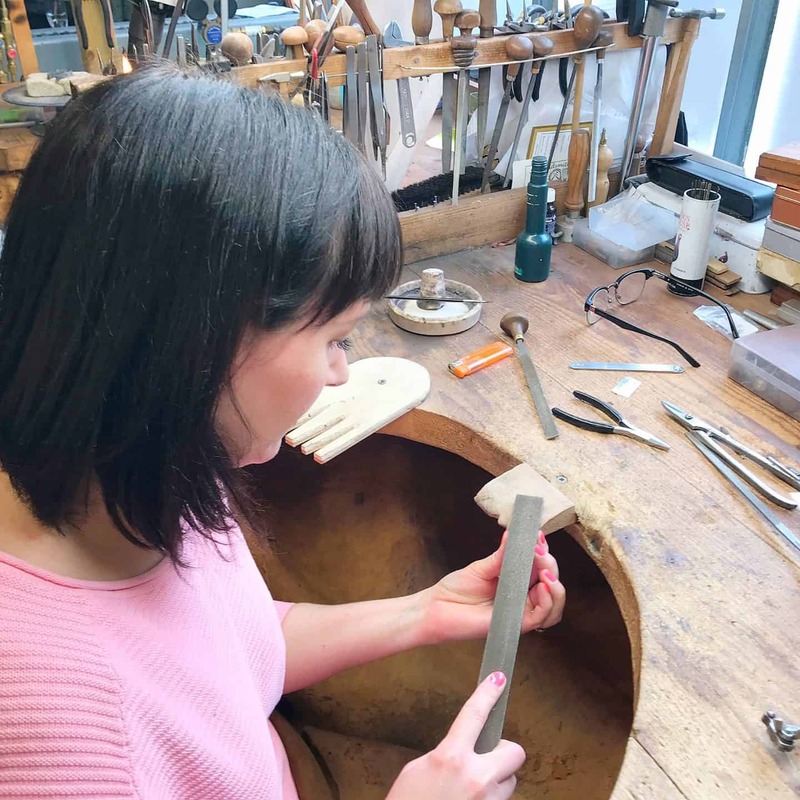 Around 60-70% of customers at The Goldsmithy Goldsmiths help make their own jewellery, making it much more special, especially for wedding rings. And that’s exactly what I, and some other lovely Milton Keynes bloggers tried our hands at. 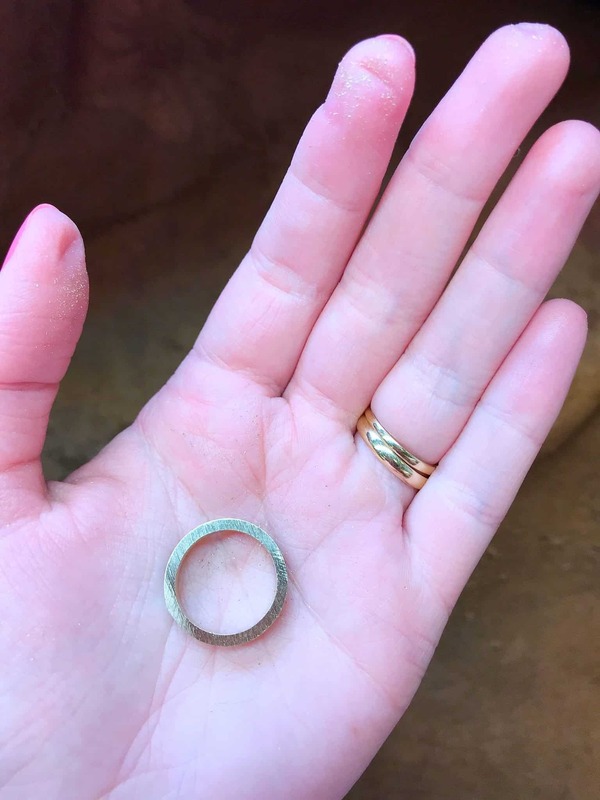 I actually filed a gold ring, and let me tell you, it’s pretty tricky! This is the ring I was working on. You can see the dents in my fingers and thumb from where I was gripping it, the tiny specks of gold I filed off. 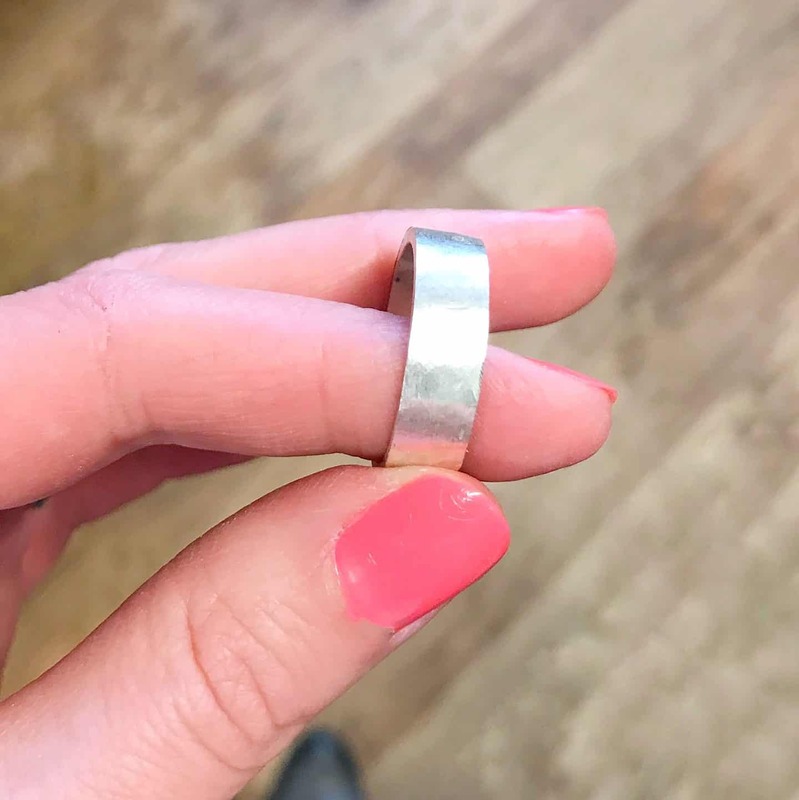 We all had a go filing and polishing a ring, and it was so interesting to see it go from a dull circlet to a beautiful shiny ring. 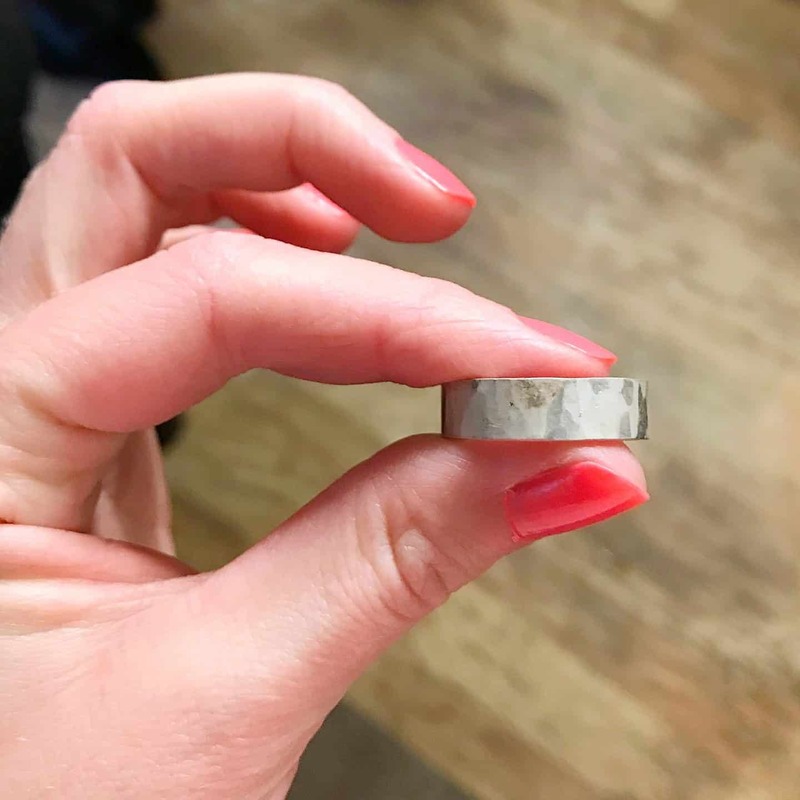 This is how the ring changed over the morning, from rough and dull, to smooth, to polished. When we were looking for wedding rings many years ago, we had real trouble finding anything individual. In the end, we commissioned a jeweller to make something bespoke for Ryan. I just got a simple gold band as I have Ryan’s great nan’s vintage engagement ring and wanted something plain so it could shine. I’d have loved to have made his ring, but it didn’t occur to me I could back then. I think it would be so special to have some jewellery made by a talented artisan, rather than something mass-produced. We rounded off the morning with some gorgeous food from Cameron’s Kitchen in Stony Stratford. Thanks guys, it was yummy! 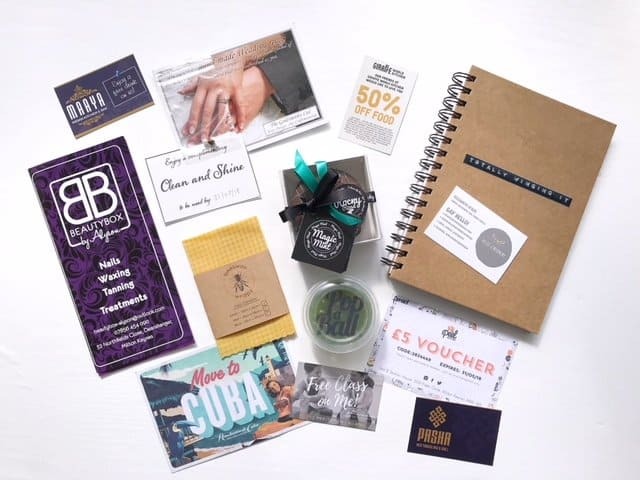 We went home with some lovely treats from Peel Juice Bar, Hello Stationary, Pasha Turkish Bar & Grill, Beauty Box by Alyson, Revolucion De Cuba, Cameron’s Kitchen, Giraffe World Kitchen, Beeswax Wraps, Popaball, Rocky Road Treats, Whitespace Yoga Studio and Maaya, thanks guys. It was a lovely way to spend the morning, and I’ll be going back soon to get my engagement ring cleaned – it’s full of make-up and cake mix! 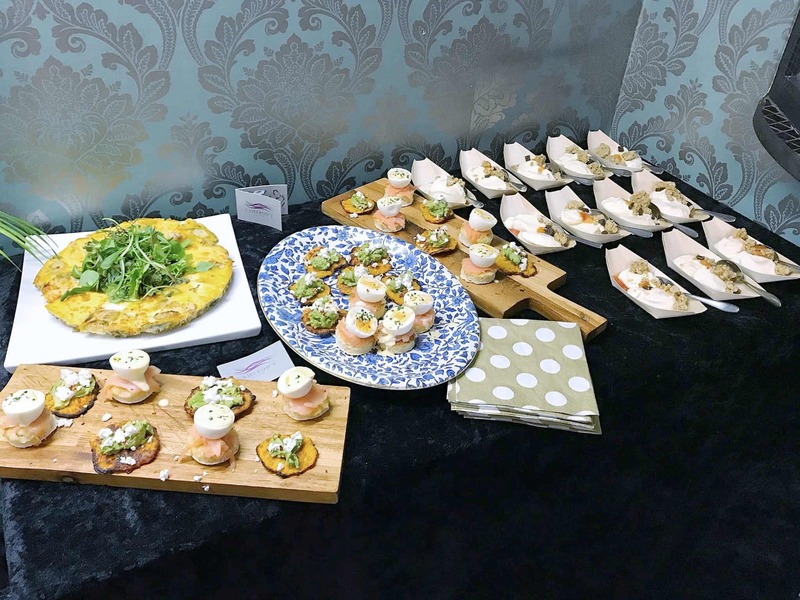 Thanks to Sophie from Sophie’s Suitcase and the MK Bloggers Network for organising this event with Brand Mission.